For Vincent M. Igo, the house by the side of the road was both literal and figurative. He spent nearly his entire life at 10 Cocasset St., home of his grandfather and uncle where he would raise his own family and where his daughter now resides. Virtually his entire life was played out within walking distance of the center of town where, in the words of Foss, “the race of men go by” which enabled him to feel every heartbeat of the community for more than 80 years. Active in football, basketball and baseball both as a player and manager throughout high school, he attended Dean Junior College following graduation and did a short stint with the Coast Guard in World War II, returning in time to help with Home Front activities during the war. While Vin was a student at Dean, the town organized a summer playground program and he was hired to supervise games and activities for the children. Hired by The Foxboro Company following graduation and eventually becoming manager of Employee and Community Relations, the job was the perfect base for Vin, spreading corporate largess that benefited virtually every activity in Foxboro. It is doubtful anyone realized the full impact of a decision made in 1947 to name Vin the first news reporter for The Foxboro Reporter (which the Foxboro Company owned at that time). He also became the first staff photographer, taking the first photo to be published by a staff member. His active involvement with the newspaper continued for 59 years until his death. His weekly column, Going Along with Igo (the Vin was added later) became one of the longest running in the nation and Vin was named to the New England Press Association Hall of Fame. His first exposure to public office came in 1942 when named to the largely ceremonial post of Fence Viewer, a position he held the remainder of his life. His first appeal to the electorate came in 1959 when he became a candidate for School Committee. He was elected by a large margin and was returned to office repeatedly throughout his lifetime, still serving at the time of his death. During his tenure, the town built the Taylor, Lewis and Burrell Elementary Schools as well as a new high school in 1963 and another in 1972. When that opened, the 1963 building became the John J Ahern Middle School named for Vin’s longtime friend and high school classmate, John J. Ahern. 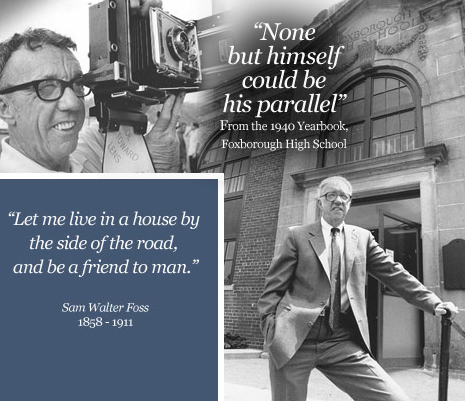 He had the honor of seeing the 1928 Foxborough High School at South and Carpenter Streets, where he attended classes in grades seven through 12, converted for school administration use and named the Vincent M. Igo School Administration Center in 1975. The entire complex was later refurbished as an elementary school and the name changed to the Vincent M. Igo Elementary School. Growth of the school population, building and renovating schools, Proposition 2 ½, line-item budgeting and block scheduling dominated the headlines during his years of service. But the goal for Vin, who was the swing vote to establish the METCO program in Foxborough, was to empower each and every individual student that they might take charge of the rest of their life and live it abundantly. An elected and appointed public official, serving concurrently in multiple positions for an accumulative total of 179 years, it appeared as if Vin was everywhere at once. Figuratively, if not literally, he was, because if he wasn’t involved in a particular project himself, he was the “go to” guy for others that were, and in ways both large and small, he was at the center of life in the village. At one time or another, Vin seemed to do it all. Bail Commissioner, Justice of the Peace, 1959 – 2006; Municipal Garage Study Committee 1965; Building Committee 1966; Playground Committee and its successor, Board of Recreation 1961 – 2006; Recreation Facilities Committee 1966 – 1968; Trustee, Foxborough State Hospital 1963 to its closing in 1975; Playing Fields Committee 1994 – 2006; Pond Home Trustee 1994 – 2006. This is but a glimpse of the man who also helped start Little League in Foxboro, organized the original band concerts, served in the Foxboro Lions Club and Knights of Columbus, was a lifetime communicant of Saint Mary’s Church, a life member of the International Basketball Officials, an incorporator of Foxborough Savings Bank and the list goes on. For Vin, the public servant, it wasn’t that he served or how long he served. His life was all about why he served, how he served, who he served and what difference it made in the lives of others.